So wonderful, it steamed up the lens! This is currently among my favorite “fast foods.” I prefer extra-firm tofu (more protein per pound and usually the same price as less firm types), but this should work for any style. Optional: drain the tofu and squeeze lightly to remove some extra moisture. I use two blocks of tofu and put both next to each other on a plate, then put a second plate on top with a can of tomatoes or something as a weight to slowly press out some moisture. I like my BBQ tofu over brown rice, so I recommend you first start the rice, then set the tofu up to be squeezed, then get a drink and go watch the news or read for a bit. About 15 minutes before the rice is ready or you want to eat, set a deep skillet to heat. 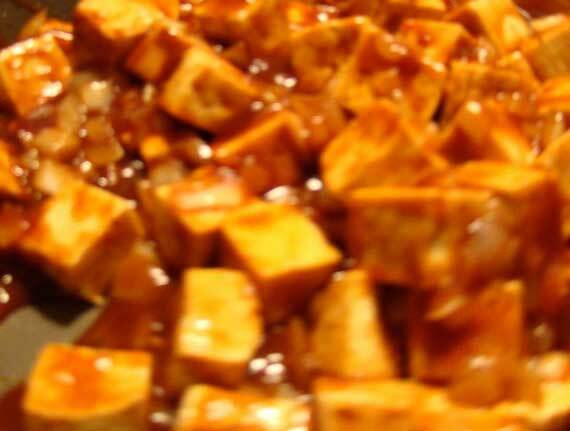 Remove the tofu from the impromptu press, shake off extra moisture, and cut into about 3/4 inch cubes. I do two layers of about 20 pieces per 15-ounce tofu block. Add a bit of olive oil to the pan, then slide in the tofu to sizzle for a few minutes. Then turn it so a fresh side is down and sizzle a bit longer. Repeat if you have time. Or skip all this. Add barbeque sauce*. Stir gently to coat tofu. Simmer until tofu is heated through. Serve over brown rice. Options: Sometimes I cook up some onions before I add the tofu. Get crazy and add some frozen peas with the sauce. Or chop green onions and cilantro and top each serving with the greenery! * My favorite bottled BBQ sauce is Trader Joe’s, which has no HFCS. It’s kinda smokey and sweet, so I often add some hot sauce and garlic.